The location was excellent, in walking distance to all the most attractions The staff's very helpful and friendly. I can recommend the hotel to my friends for a short stay. The location was excellent. Right in the center of town. The wine, snacks, complimentary breakfast!!! The location was AMAZING! The kitchen & bathroom supplies were very appreciated. This is a location I could stay at for a week & have everything I needed. Location. Service. Apartments really nice and clean. Excellent choice! Location is good , very close to restaurants, shopping mall , and public transportation . Great location, very central to downtown Madrid. The room was very clean and comfortable. Super accessible. The staff at the counter were very friendly and helpful. Location was great. We chose this place so we could have a kitchen. We prepared most of our meals. Great Tex-Mex restaurant a few doors away. Location, staff, well kept and clean, and surprisingly quiet for thhe location. Lock in a great price for Apartamentos Blume Cruz – rated 9.2 by recent guests! Apartamentos Blume Cruz This rating is a reflection of how the property compares to the industry standard when it comes to price, facilities and services available. It's based on a self-evaluation by the property. Use this rating to help choose your stay! 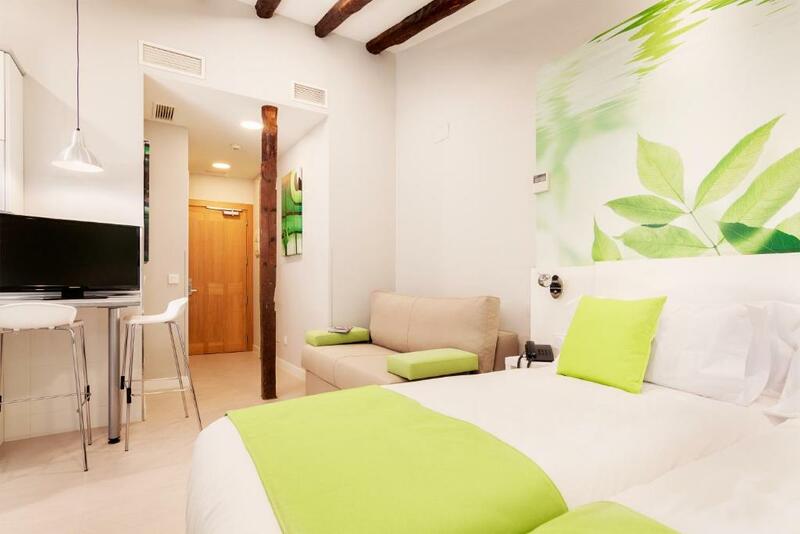 These traditional restored apartments are set in the most authentic area of old Madrid, only a few feet from Puerta del Sol. If you want to do some tourism, see Madrid and feel at home in a personal and warm atmosphere, these apartments are ideal. WiFi internet access is available. You can enjoy breakfast in a bakery 5 minutes away from the apartments on foot. From the apartments you can easily visit numerous cultural sites on foot, such as The Royal Palace, Plaza Mayor and Preciados Street. You can also sample the unique Madrileñan atmosphere with its famous tapas and bar culture. When would you like to stay at Apartamentos Blume Cruz? This apartment with free Wi-Fi includes one twin bedroom, a full kitchen, bathroom and a living room with a sofa bed. Daily cleaning is included. This air-conditioned apartment features 2 twin bedrooms and 2 living rooms with a sofa bed. There is a bathroom with a shower, 2 kitchens with a dishwasher, microwave, stove and coffee maker, utensils and kitchenware. Free Wi-Fi is available throughout. Somos una empresa que nos gusta cuidar los detalles.Personalizamos y tratamos a cada uno de nuestros establecimientos de una manera única. El diseño alegre y el confort es una máxima. Disponemos de una recepción de 8 horas diarias de Lunes a Domingo y posteriormente disponemos de un servicio de autocheck in con atención telefónica permanente. House Rules Apartamentos Blume Cruz takes special requests – add in the next step! Apartamentos Blume Cruz accepts these cards and reserves the right to temporarily hold an amount prior to arrival. Please note that guests will receive an email several days before arrival with instructions on how to collect keys and check in using the property's auto check-in machine. Reception is open from 9:30 until 18:00. If you arrive outside reception opening hours, you can use the check-in machine. Phone support is available. Please note, this hotel does not accept American Express as a method of payment. The apartment is small in the size of not more than s standard hotel room. Great hospitality by lovely Marvel . The apartment is very central with easy access by foot to anywhere in the city. Lots of bars ,restaurants and shopping area in just of few steps. Great service, very helpful , central location and very cozy apartment! Excellent service, very friendly staff. The property is just in the centre of Madrid, close to all places we wanted to visit. Cockroaches!!! Huge beast in the bathroom. We told the reception but they casually said “oh yes.. we did some fumigation recently..”, then they sent someone to remove it but when we came back later was other one in the bathroom. We had to sleep with lights on. That actually spoilt our weekend very much. And instead of some refund we got a bag of popcorn... double bed was just made of 2 single ones and that wasn’t very comfy construction. Location was great! Very close to everything and just 3 min from Sol. Some nice restaurants nearby. Was easy to check in earlier. Apartment was clean and we got shampoo etc. At the reception downstairs you get free tea, coffee and little things for cooking. I would have loved to have a window in the bathroom to have daylight. The girl at the reception is very kind and nice and helpful. the location is amazing, best stay in madrid, the light and the small balcony are perfect; I stayed there with a friend and we felt at home, going to come back for sure ! The automated check in process wasn't very clear and it was too complicated. Non-working coffee. No area rugs so room not especially comfortable; a bit sparse. And one day/night we could smell smoke distinctly in our non-smoking room, presumably from a vent. Awful. Awesome location if you want a lively and bustling neighborhood filled with restaurants and bars!